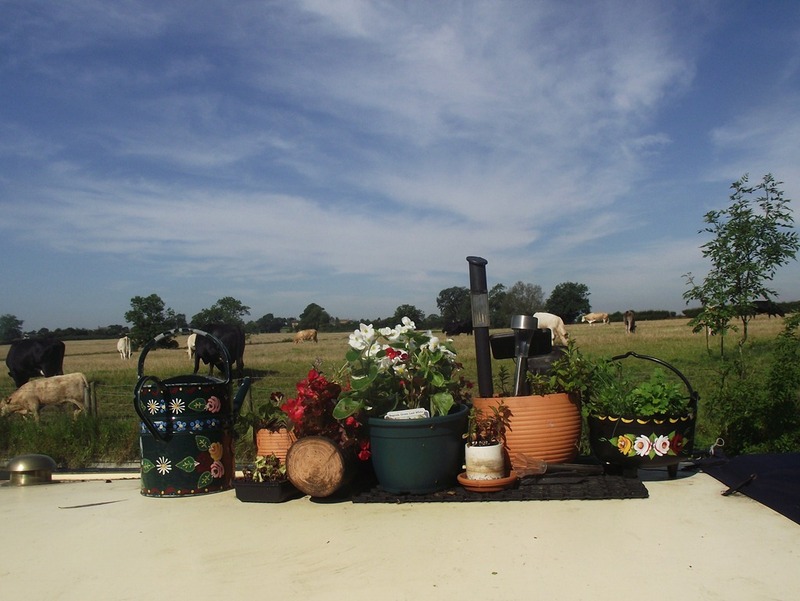 It was so hot boating yesterday we resolved to make an early start and believe it or not we did, slipping our mooring a 7am just as another early riser slid out of Cropredy Lock. I guess they were far earlier than us as all the locks were in our favour all the way up to the bottom of the Claydon flight. 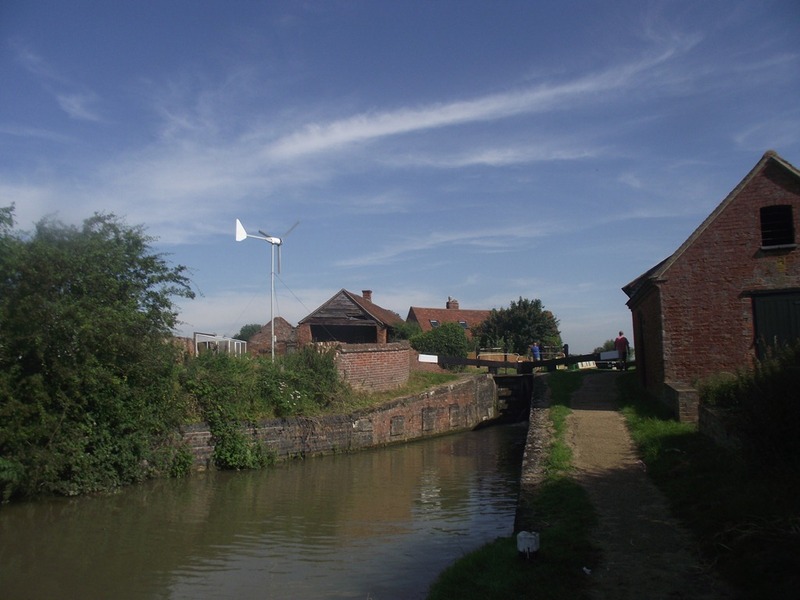 At Claydon we slowly followed a Calcutt hire boat all the way up but once at the top lock they were gone and we didn’t see them again until we arrived at Fenny Compton. We did more chores, a pump out at Fenny Marina and after mooring up close to The Wharf Inn we did our washing at the pub’s launderette and made arrangements with Penny, the landlady about our forthcoming Ruby Wedding Celebration. So day 40 has arrived, and on Sunday so does the 40th Anniversary of our marriage, so perhaps I should have called this our Ruby Cruise. 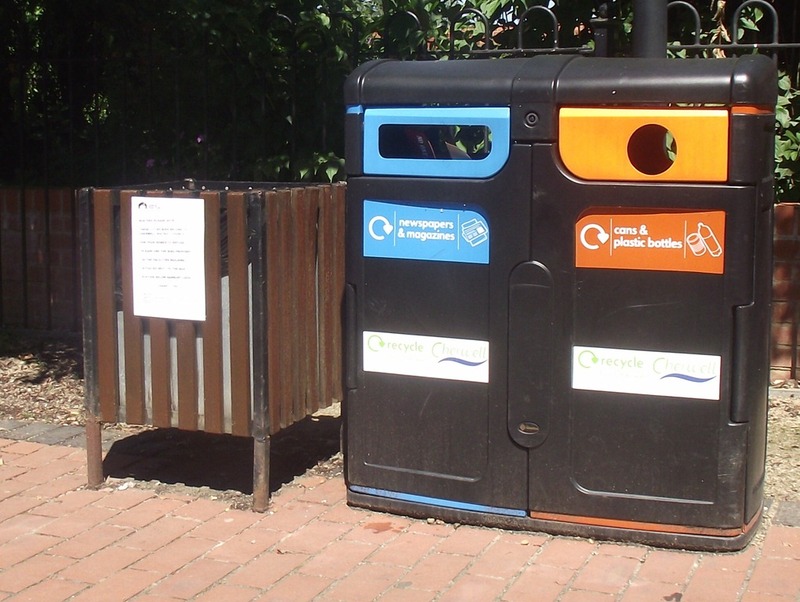 We had lots of errands to do in Banbury (like collecting 5 weeks worth of post) which took up most of the morning, but had time to notice this BW notice by our mooring asking boaters not to dispose of their rubbish in these bins (pity the photo isn’t in focus). ‘Honey Pot’ moorings which were packed from end to end, but I thought it a bit much that Banbury Town Council should object to boaters rubbish as there is a very good chance that said rubbish is the detritus of purchases made in the town, supporting the local economy. 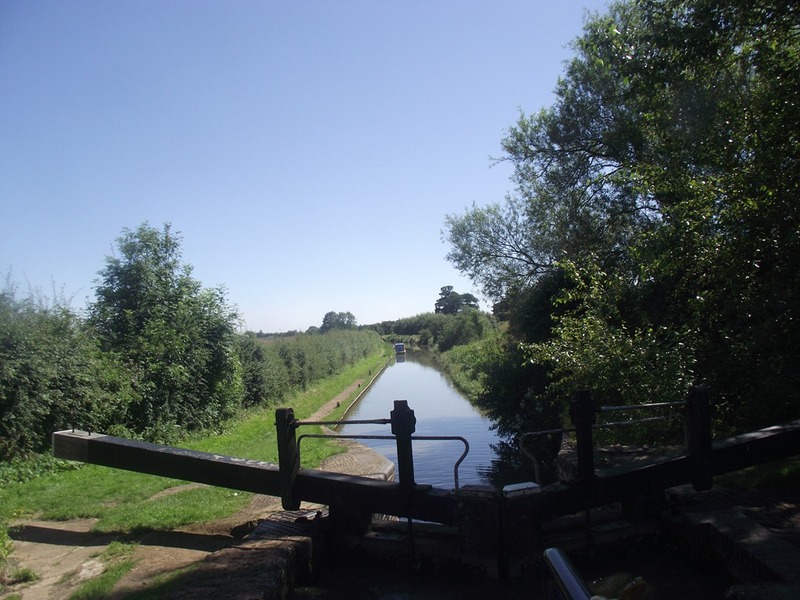 We made our way out of town and had an easy run in blazing sunshine into Cropredy where we spent the night. Today, a short hop from Aynho to Banbury filling up with water, diesel and gas before we left at Walker Services, Aynho Wharf. We called in at The Pig Place on the way up, bought eggs and sampled Buffalo Milk Ice Cream! 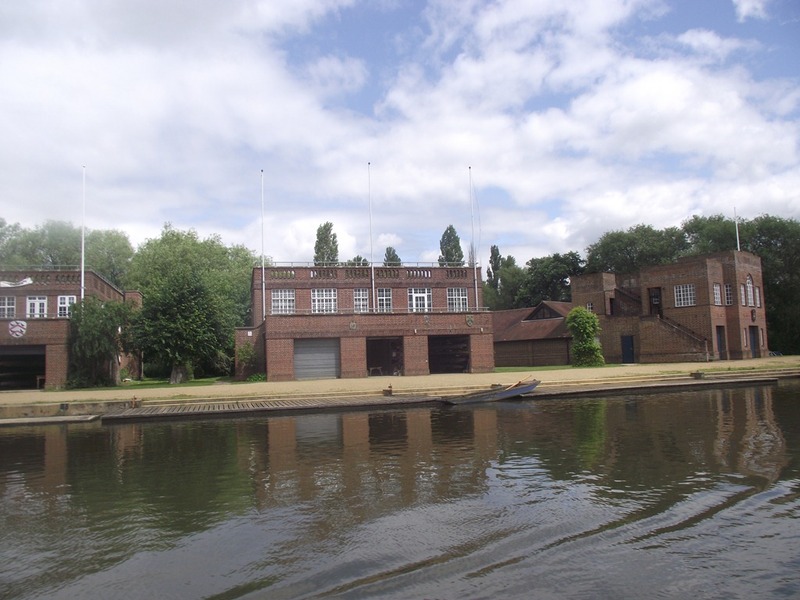 We moored on Castle Quay, Banbury and then picked up the car from Heyford and shot off to Upton-on-Severn, to take a look at our son’s boat gearbox which had been protesting at coming up the Severn. I changed the oil and checked the levels on everything else so hopefully all will be well as he leaves the river for the calm canals at Worcester. Today being Sunday and us being in Heyford we decided to surprise our friends at church by turning up at Heyford Park Chapel, they were very pleased to see us again after being AWOL for so long. 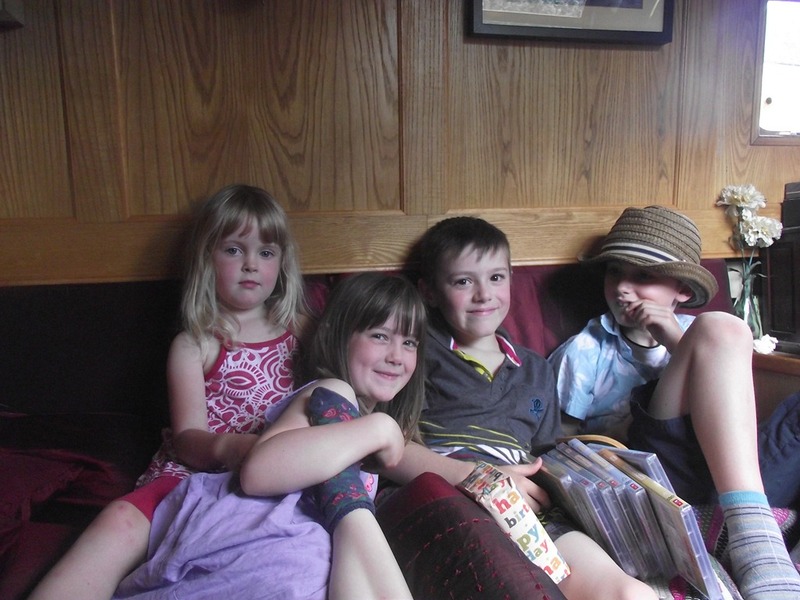 We had arranged to meet our friends from Heyford, Chris, Emily & their boys Oliver & George for a trip up to Aynho after lunch and we had a fantastic afternoon with them in the sunshine. 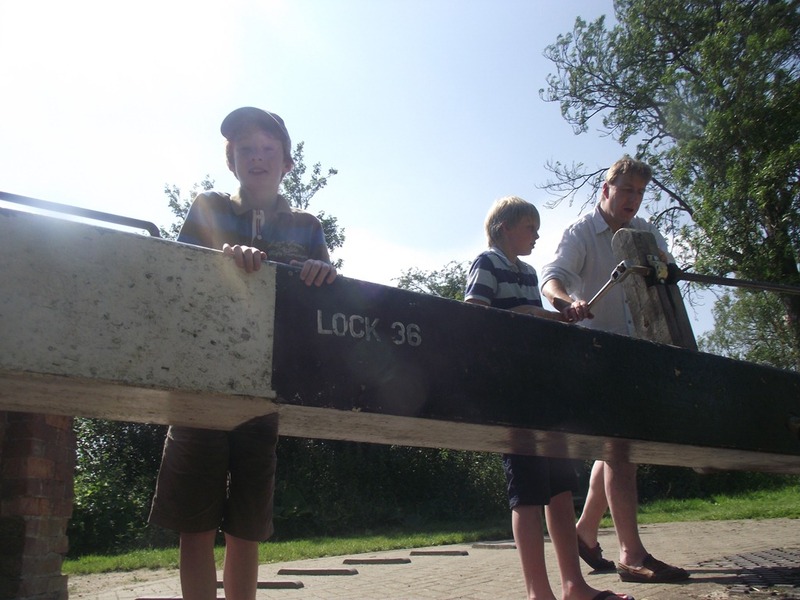 The boys enjoyed working the locks for us and thanks to them we made good time, they all had a turn steering the boat and acquitted themselves well. After arriving at Aynho more visitors were waiting for us! David and Anne from back in Gloucestershire were caravanning nearby and phoned to see if they could visit, Dave was my boss at Listers more years ago than either of us care to remember and it was good to catch up with them. Last night, as arranged, we met up with Maffi and Bones at the pub and also had the pleasure of meeting fellow bloggers Al & Del from nb Derwent 6 before they headed off for the Thames. 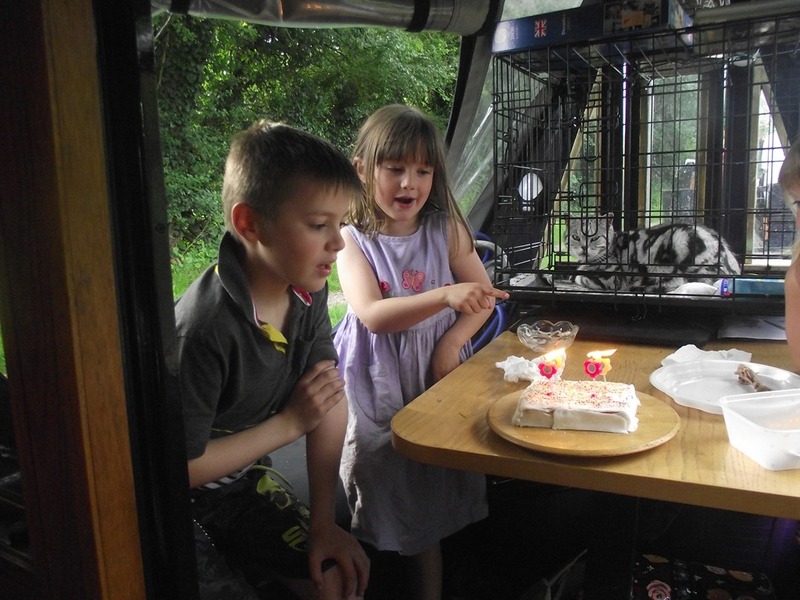 Today was a family day as it is our grandson’s birthday tomorrow, we had a boatful of visitors, Jeremy, Rebecca, Iona, Isabelle and of course the birthday boy, Morley plus his mate Connor. We headed off on familiar territory bound for Lower Heyford, with the kids enthusiastically ‘helping’ us through the locks. We took a break at The Rock of Gibraltar where Stamatis and family were busy with an influx of diners brought out by the sunshine. As we went on our way, Joy contrived to feed us all with baked potatoes and mince in a bolognaise sauce. 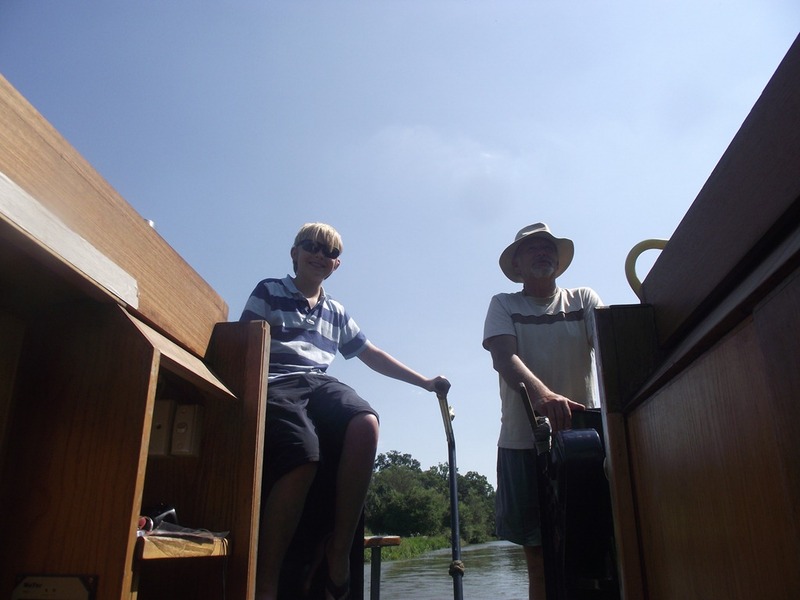 The canal was not overly busy and both Jer and I had to get used to a narrow canal again, me after the Thames and he, the Gloucester & Sharpness, it’s funny how you feel 20 foot is close to another boat on the river but 6 inches is OK on the canal! Oxfordshire Narrowboats’s dayboats were out in force and we passed the time of day with someone at nearly every lock. 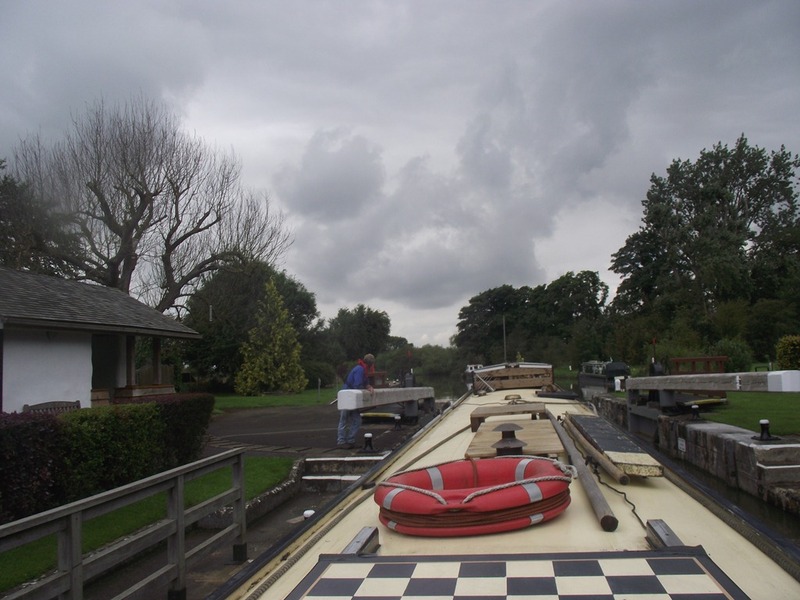 When we approached Heyford we met two more of their hire boats setting off on their holidays. We stopped on the 48s (48 hour moorings) next to friends on nb Prancing Pony and while Jer & I went up to the boatyard to say hi to the owner, David and his staff Joy and Becca prepared a birthday tea for Morley complete with jelly worms, thanks Bones for the link! Cars were shuffled so we are ready for the next leg to Banbury and we said goodbye to the gang as they had to make their way back to Gloucestershire. We managed to get TV via the satellite dish but were too tired to watch it so went to bed early only to be woken up by a phone call from our daughter, Karen, in Australia. Miraculously we managed a chat despite the abysmal phone signal here by dint of positioning the phone as near to our signal booster as possible and talking to her on speakerphone. No internet signal here whatsoever so this post will have to be uploaded when we move on. 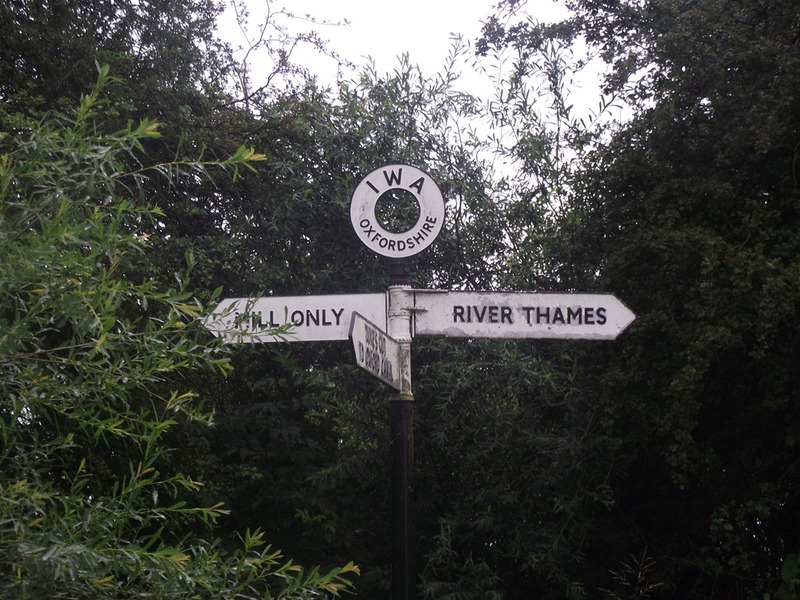 After fortifying ourselves with bacon and eggs for breakfast we rang Osney Lock at 11am as the lock-keeper had suggested and were rewarded with the good news that they were now on Yellow Boards. “Are you busy?” we said “Not yet they replied, the news hasn’t got out yet!” so off we went. 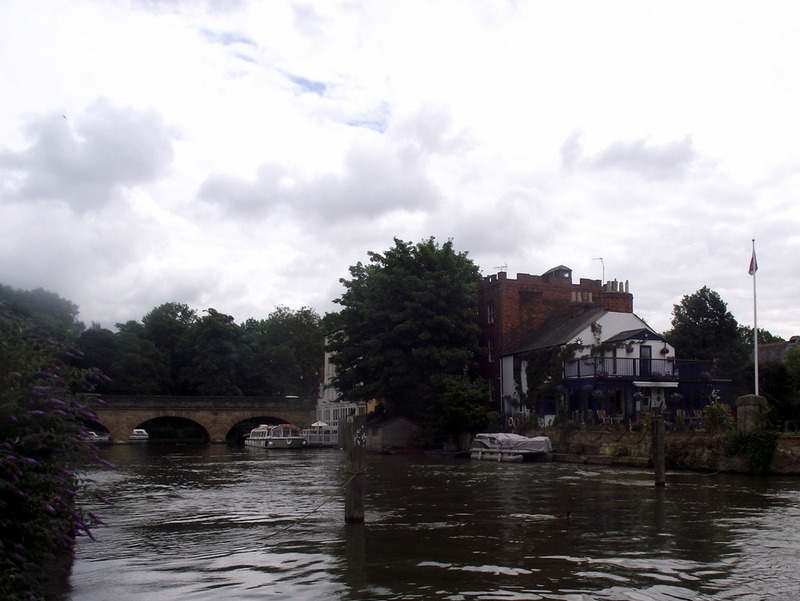 than when I walked up yesterday and then there was just Osney Bridge to get under, a nominal 7’ 6” air draft (Headroom). We need 7’ 0” to clear our topboxes and the lockie reckoned it was down to 7’ 3” we had already filled our water tank to ballast the front down and added our generator to the payload at the lock, so gingerly edging forward against the flow we were able to creep under with inches to spare. 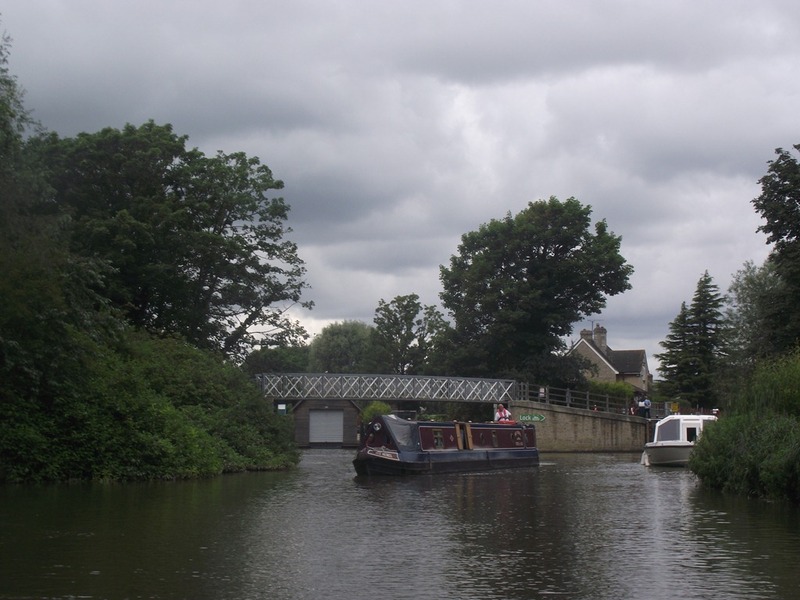 After that it was easy, Godstow Lock was a doddle, there was a strong flow across Kings Lock entrance but the lockie had the gates open ready for us and got in safely, albeit with the stream pushing us diagonally as we approached. A right turn, up to the weir, then hard left and we were in the mill stream in transition between river and canal. 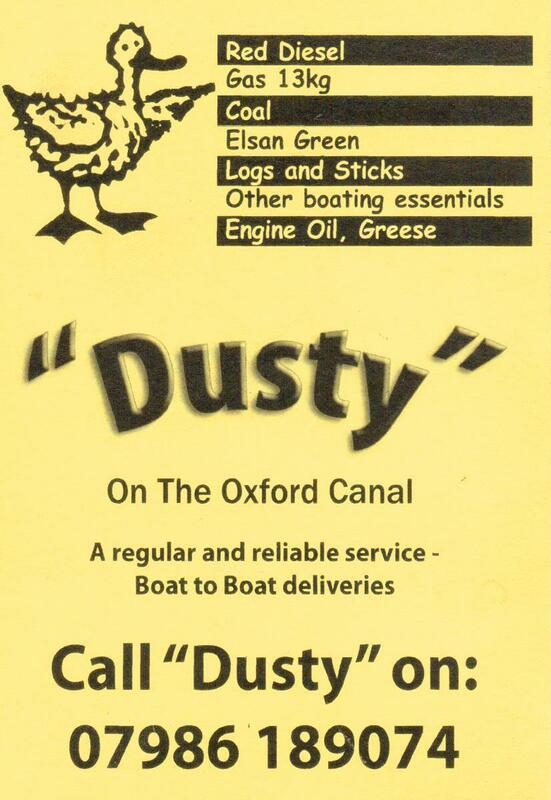 Apart from almost missing the turn into Dukes Cut and heading up to the old mill we managed famously and were soon back and able to relax on the familiar surroundings of the Oxford Canal and having to work the locks ourselves. Joy was back at the helm to take the boat through, while I operated the locks. 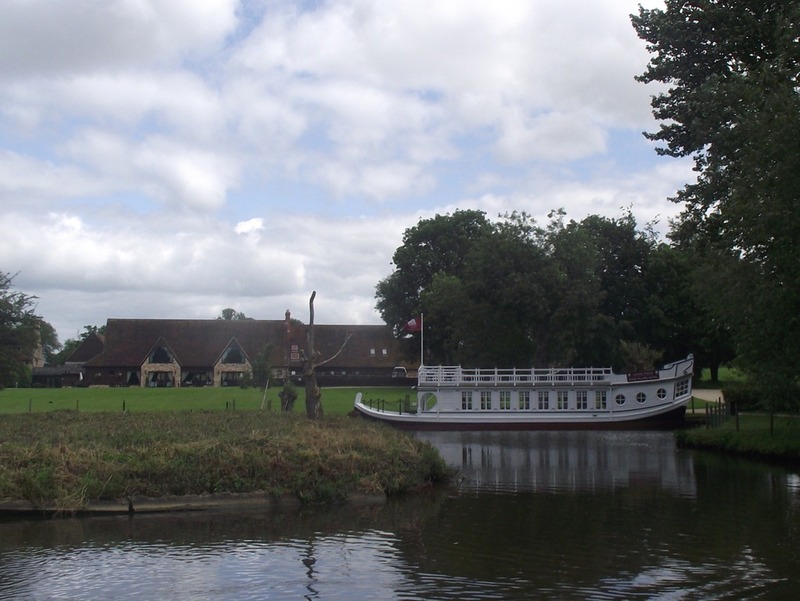 A phone call to our local spies elicited that there were no moorings by Thrupp Cottages, but we were fortunate to find a vacant space outside The Jolly Boatman where we hope to meet up with Maffi and Bones later on. A quiet evening at Abingdon, we took a walk through the old abbey gardens to Waitrose for a few provisions, then indulged ourselves by watching Crocodile Dundee on satellite TV, “That’s not a knife. 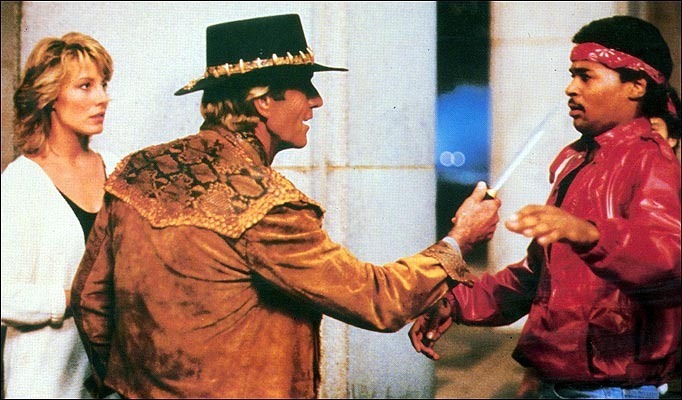 That’s a knife.” still makes me laugh. 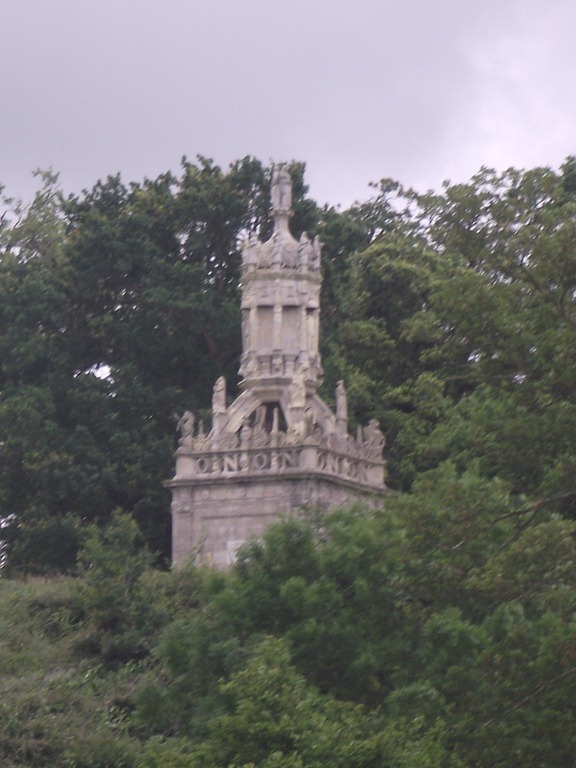 We woke up to sunshine and were away promptly and through Abingdon Lock, on the five mile stretch up to Sandford Lock we spotted a couple of curiosities, first Nuneham Park where this monument caught our eye, some research on Wikipedia revealed that it used to stand at Carfax, in the middle of Oxford. 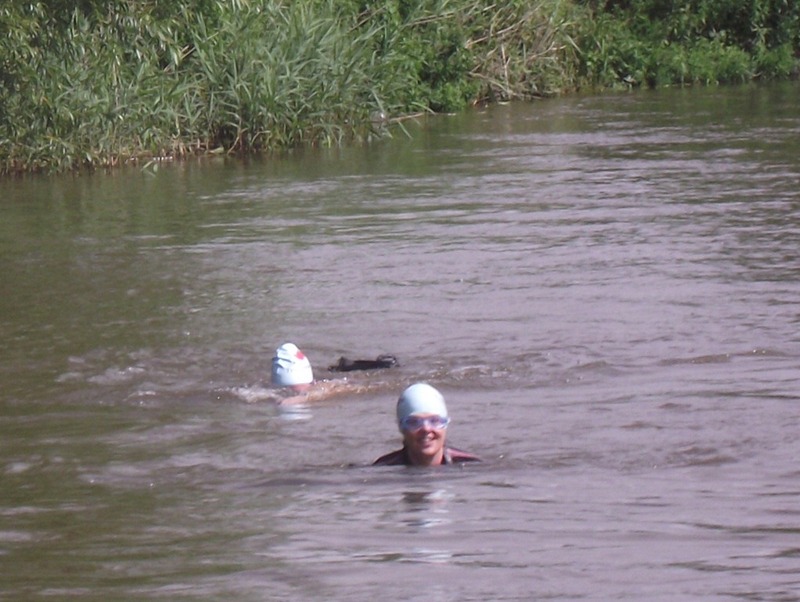 Our next surprise was what appeared to be four pale blue-green buoys across the river but an arm appeared from one of them and we realised it was people swimming! They seemed very relaxed and even had the energy to chat with us as we passed. We stopped for lunch at the Kings Arms at Sandford Lock and moored up in front of Tyseley, the Mikron Theatre Company’s narrowboat. We spoke to the crew/cast who told us they had been there for a fortnight waiting for the river conditions to improve. They are performing tonight at Eynsham so I guess they have back up road transport. 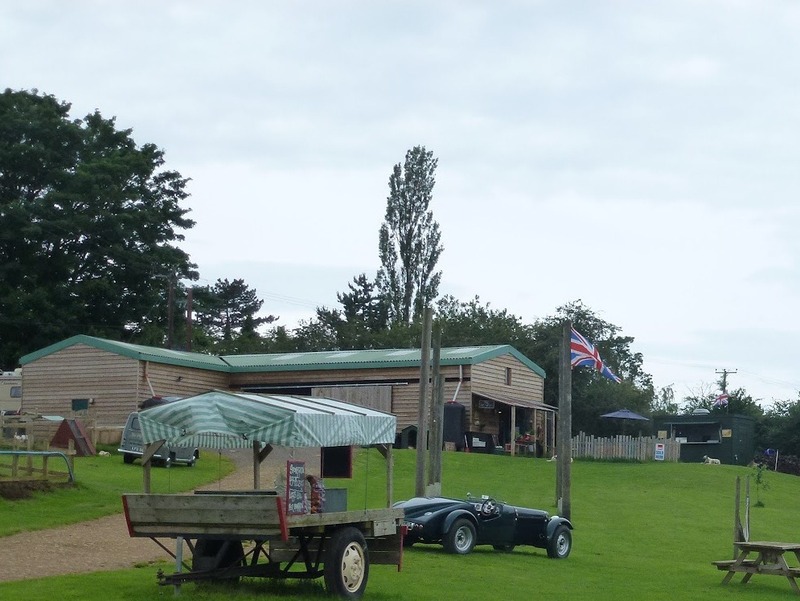 By coincidence they are at The Wharf, Fenny Compton on the 29th July, the day after we will be celebrating our Ruby Wedding anniversary there. Here you can find all their tour dates. We spotted this fine craft at the Oxford Thames Four Pillars Hotel. 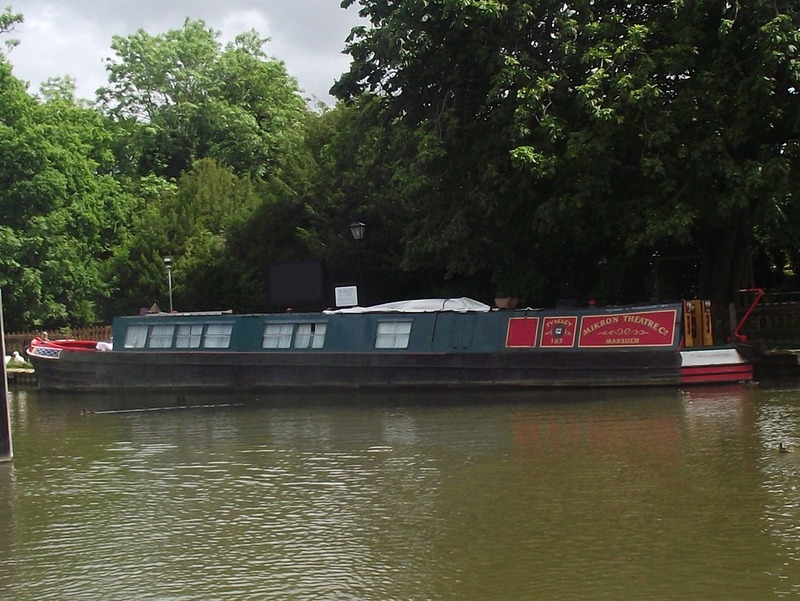 Our journey ended this afternoon moored up opposite the University Boathouses, just before Folly Bridge, Oxford. Osney Lock is still on ‘Red Boards’ and I took a walk up there and had a chat with the lock-keeper who suggested we phone tomorrow as he hoped the conditions would have improved overnight. 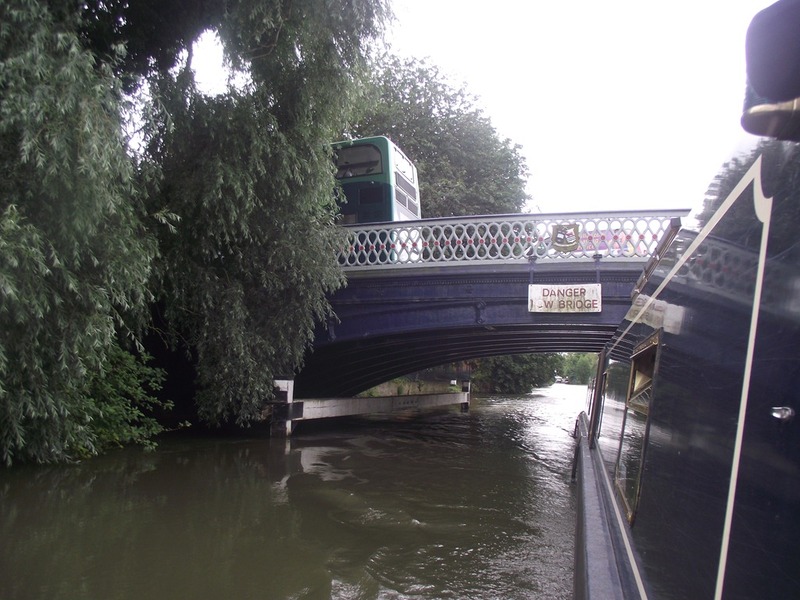 Osney Bridge certainly looks very low, so I hope our top boxes will fit underneath. We have been entertained this evening by watching the rowers practicing and Salter’s Steamers plying up and down with their sometimes noisy passengers and now to watch Lewis to complete the Oxford experience.